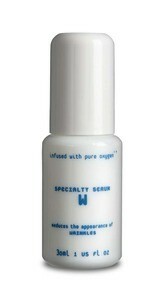 W is for wrinkles, or in the case of Oxygen Botanicals Specialty Serum W, for getting rid of them. This powerful anti-aging treatment serum turns back the clock on your skin, reducing fine lines and wrinkles while firming the skin for a brighter, more youthful complexion. W is for wrinkles! Or in this case, W is for getting rid of wrinkles to reveal a smooth, wrinkle-free, youthful complexion. You guessed it, Oxygen Botanicals Specialty Serum W is for wrinkles or, rather, getting rid of them. A powerful blend of anti-aging peptides conditions the skin, reducing the size and appearance of fine lines and wrinkles while firming and toning the skin for a more defined, youthful complexion. At the same time, Oxygen Botanicals Specialty Serum W nourishes the skin, giving is a silky smooth texture that looks flawless and feels amazing. Hydrating ingredients infuse all layers of the skin with moisture while plant hormones lock moisture on to last up to seven hours after application. Oxygen Botanicals Specialty Serum W is recommended for all skin types. First, cleanse and tone the skin with Oxygen Botanicals products, Then apply a layer of Oxygen Botanicals Specialty Serum W to the cleansed surface of the face and neck, allowing it to completely absorb. Use very day to enhance your complexion and reduce the signs of aging. The key ingredients in Oxygen Botanicals Specialty Serum W - Wrinkle anti-aging, anti-wrinkle treatment serum include pentapeptide-3, lactobacillus ferment, palmitoyl oligopeptide, and trifolium pratense.